This is the second post in a series of three about my travels with my dad over October break. You can read about the introduction to that trip here, the first post about our time in Bangkok here, and the final post about our trip to Hoi An here. This was my second time in Vietnam. 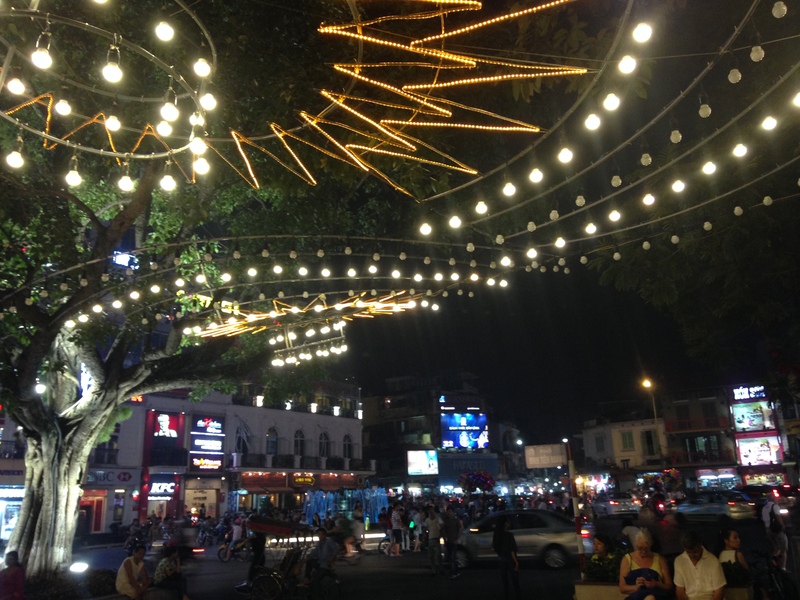 Last spring I went to Ho Chi Minh City for the weekend, which was my first experience traveling alone. 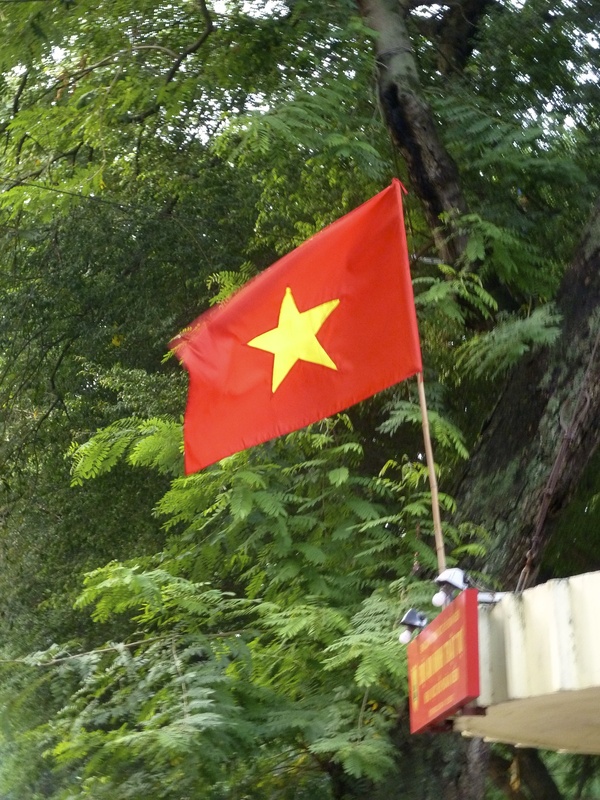 It was especially fun returning to Vietnam (though don’t get me wrong, Hanoi and Ho Chi Minh are as different as the US and the Soviet Union during the Cold War) with someone who had never been there before. Dad particularly got a kick out of the traffic. 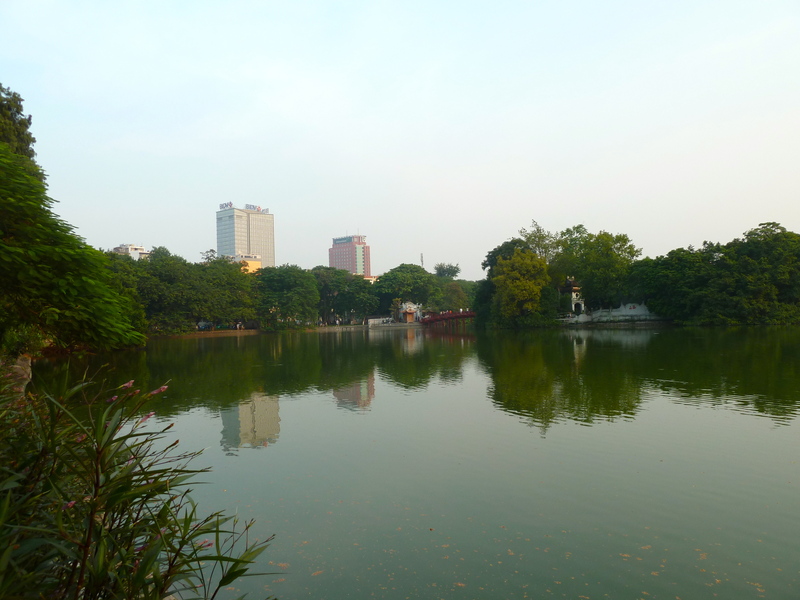 On the afternoon of our arrival, we started walking the perimeter of Hoan Kiem Lake, a walk that we never completely finished. We continued the walk on the last night that we were there. It seemed like everyone in Hanoi was around the lake that night, which was really pretty because the lake and surrounding buildings were all lit up! People were parking their motorcycles in designated areas, doing karaoke in public, meeting friends, walking dogs, and enjoying ice cream. It reminded me a lot of growing up near the Erie Canal, actually. 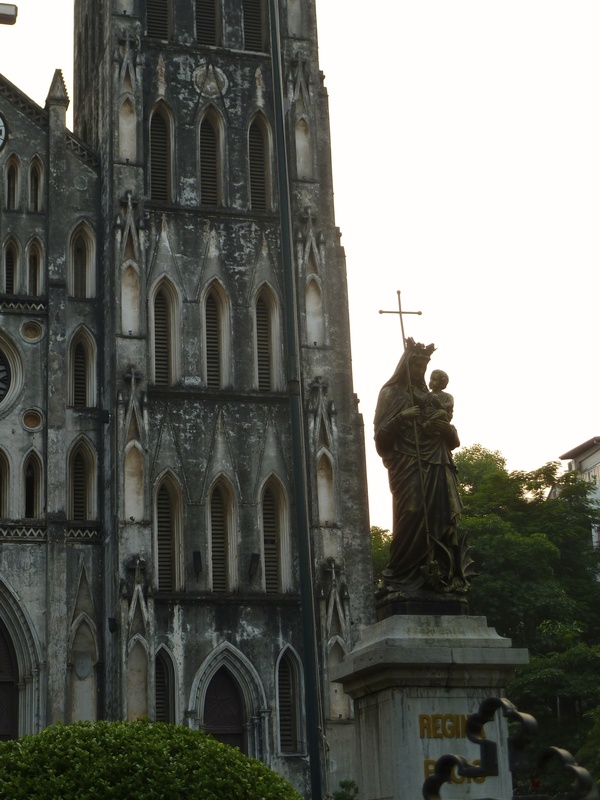 After wandering through the Old Quarter to get a feel for where we were, and to learn how to cross the streets (hint: look both ways and then just start walking), we made our way to St. Joseph’s Cathedral. 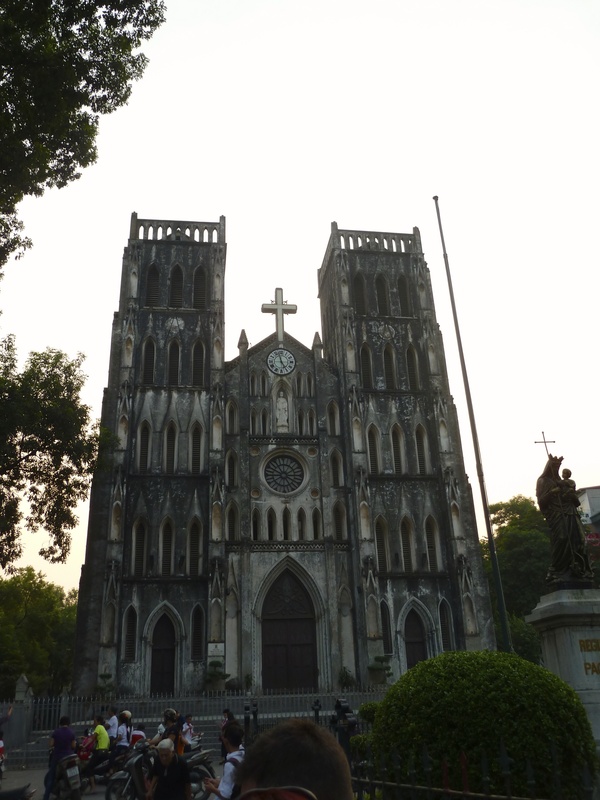 The cathedral was built during the era of French rule in Vietnam and remains open for services. We also ran into one of my students here! In stark contrast to St. Joseph’s Cathedral, our next stop was Chua Ba Da, the Stone Lady Pagoda, which is now the headquarters of the Municipal Buddhist Association. Dad was pretty done with pagodas by this point, but I managed to squeeze in Den Ngoc Son, the Temple of the Jade Mound, the next day. 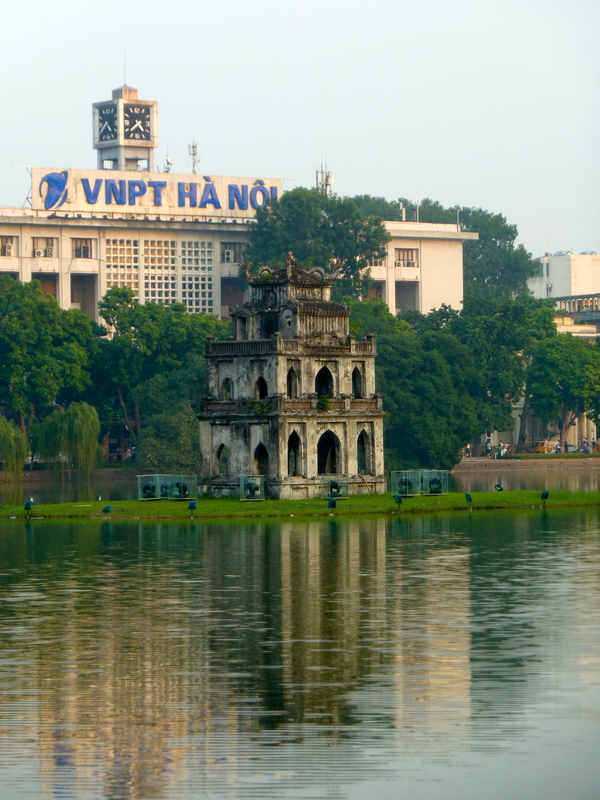 It sits in the middle of Hoan Kiem Lake and we had to cross the red lacquered Huc Bridge to get there. For much of the day, we canvassed the French Quarter, which reminded me much more of Ho Chi Minh City. There were the wide boulevards with trees, plazas, and grand colonial buildings like the Opera House. The French Quarter also contained quite a few posh stores that would not be out of place in Paris, but were rather incongruous in the middle of Hanoi. 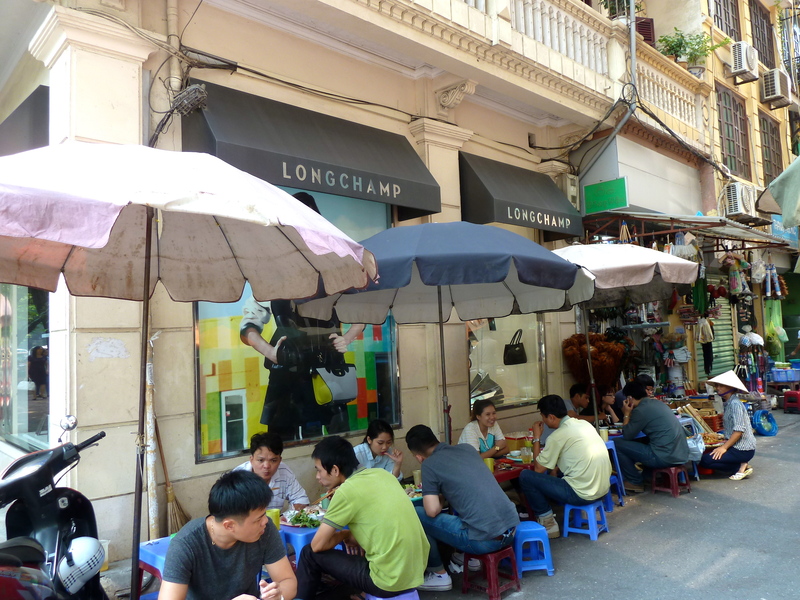 I loved the street food stands and restaurants that set up right underneath the awnings of designers like Longchamp. 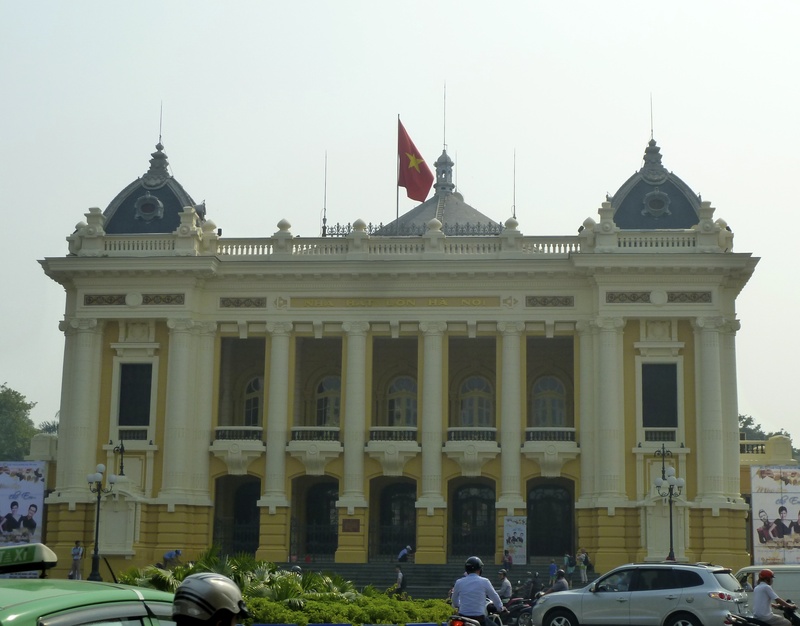 Over the course of the day, we visited the Museum of Vietnamese Revolution to learn about Vietnam’s revolutionary history, starting from the uprisings against French rule in the late nineteenth century. The museum contained fairly comprehensive coverage of the Vietnam War (or America’s War, as it’s known there) but with a distinctly different propaganda slant than what I’m used to seeing. As a social studies teacher, I’m familiar with the Vietnamese side to the war, and actually teach about the war using a translated excerpt from a Vietnamese textbook. My Ho Chi Minh City trip last spring further helped me understand the Vietnamese perspective, which I was glad to revisit. We also really enjoyed the Vietnamese Women’s Museum, which I highly recommend. 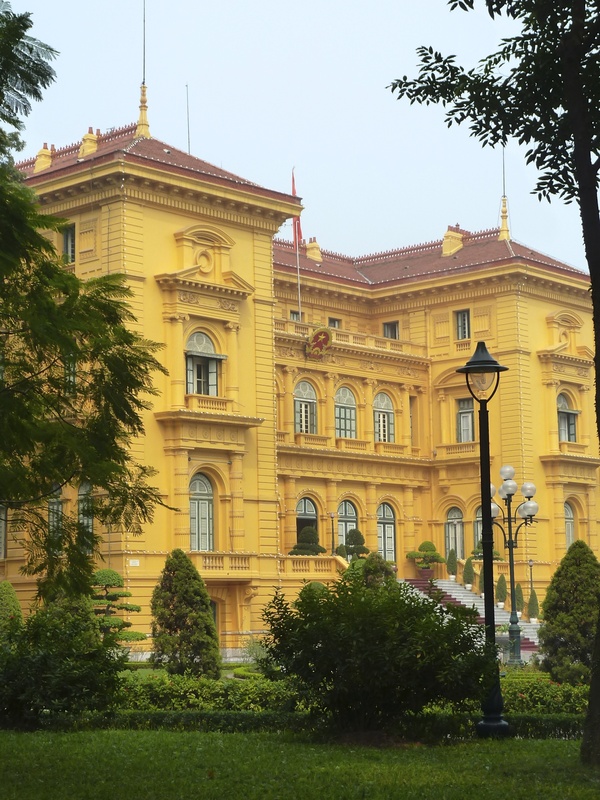 Not only is it interesting to find an entire museum dedicated to women, but it was fascinating to learn about the very influential role women played in Vietnam’s revolutionary and independence struggles. There was quite a large exhibit on female guerrillas post-World War II. I didn’t know anything about that, so it was a great learning opportunity! Vietnamese women were imprisoned, tortured, executed, and awarded the nation’s top honors for their role fighting the French and the Americans. There’s even a special award for being one of the Heroic Mothers of Vietnam. Who knew? The Vietnamese Women’s Museum also contained exhibits on clothing of specific ethnic groups, traditional marriage, childbearing customs, and religious practices, but the exhibits about female fighters were the most compelling for me. 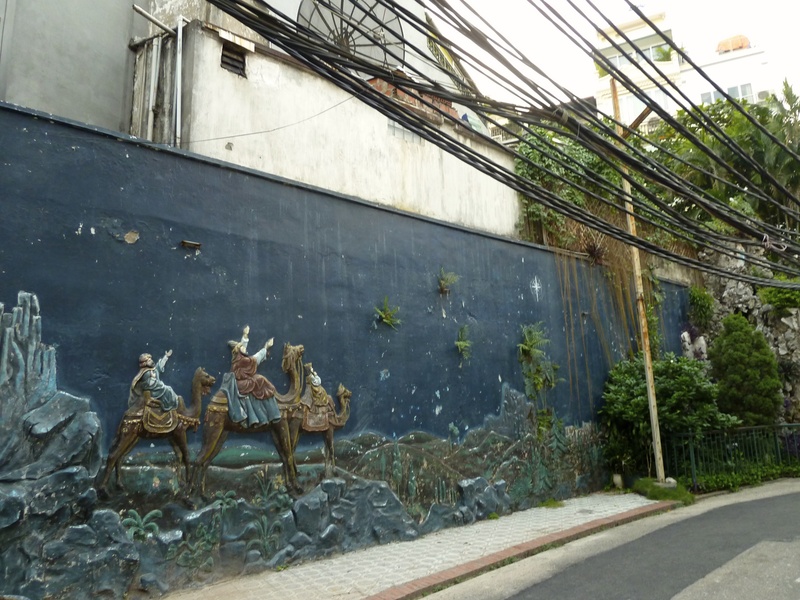 Following lunch at a vegetarian restaurant at the end of an alleyway, we headed to Hoa Lo Prison, or the Hanoi Hilton. The prison was built by the French in 1896 for Vietnamese rebels, but became famous in the US after the war because pf the American POWs, including Senator John McCain, who were held there. POWs tell stories of torture; the museum exhibits discuss ways the French tortured the Vietnamese, and then contain photos of American POWs playing basketball and decorating Christmas trees. Rather heavy dose of propaganda, I believe. Thought of everything, didn’t they? I admit, this is an exception. It’s not funny, it’s just cool that it’s in Hebrew! We saw more than one Hebrew sign over the course of our travels. The next day we hired a guide and driver to take us a little ways outside the city. Our first stop was Tran Quoc Pagoda, located in the middle of Hanoi’s West Lake. It’s home to a cutting of a bodhi tree from India, supposedly the tree under which Siddhartha Gautama achieved nirvana and became Buddha, and was a gift from an Indian leader to a Vietnamese leader. 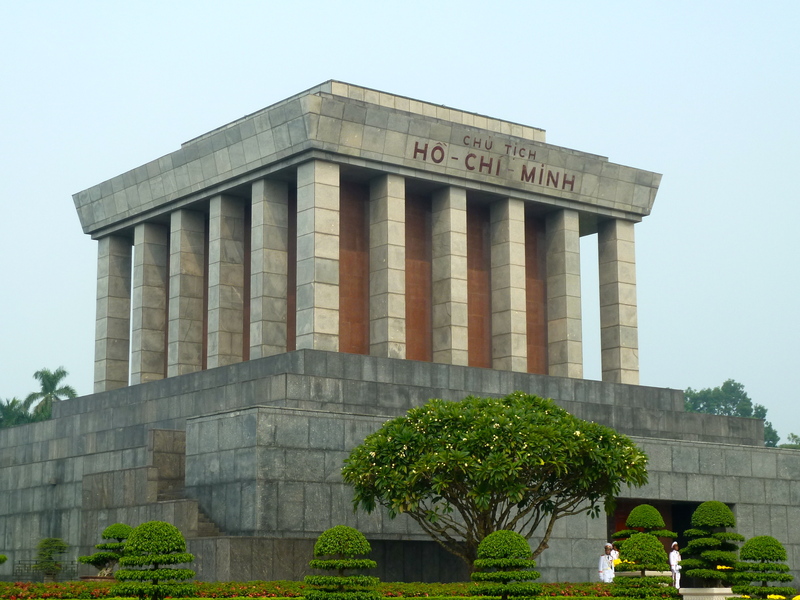 Nearby is Ho Chi Minh’s Mausoleum, which we could only see from the outside because it was closed for maintenance, which is an annual occurrence. We were able to walk around the modest home that Ho built for himself across the road from the ostentatious Presidential Palace built by the French. It’s an interesting commentary on colonialism that Ho chose to live in the simple house and use the Palace as a government office. French Presidential Palace . . .
After a quick stop at the One Pillar Pagoda, designed to look like a lotus when seen from the sky (though I obviously couldn’t get a picture from that angle), we made our way to a workshop where we learned how traditional lacquerware is made. There is a processing of painting, rubbing off, painting, rubbing off, etc. layers and layers to form a base, and then a similar process at the end to even out and seal the lacquer. What I most enjoyed was learning about the decorations. Naturally, we had to buy some art! Then it was time for the Museum of Ethnology, where we learned about Vietnam’s 54 ethnic groups. There were examples of tools, clothing, and jewellery, as well detailed descriptions (and videos!) of marriages, funerals, and religious rights and rituals. Behind the museum were traditional houses belonging to specific ethnic groups that had been moved to the museum site for the purpose of preservation and education. Excellent information about the houses themselves and the groups that live in them accompanied each. Finally, we visited the Temple of Literature, Vietnam’s oldest university. It was built in 1070 and is no longer used today, except as a historical site. University students also visit to take pictures upon graduation. University students eating lunch while waiting for their turn with the photographer. The traditional outfits are rented for the occasion; I asked. What I liked about the Temple of Literature is that it was originally a center for Confucian learning, so it contains a shrine to Confucius. Each of the four gates symbolized students’ passing of the four examinations necessary for graduation. 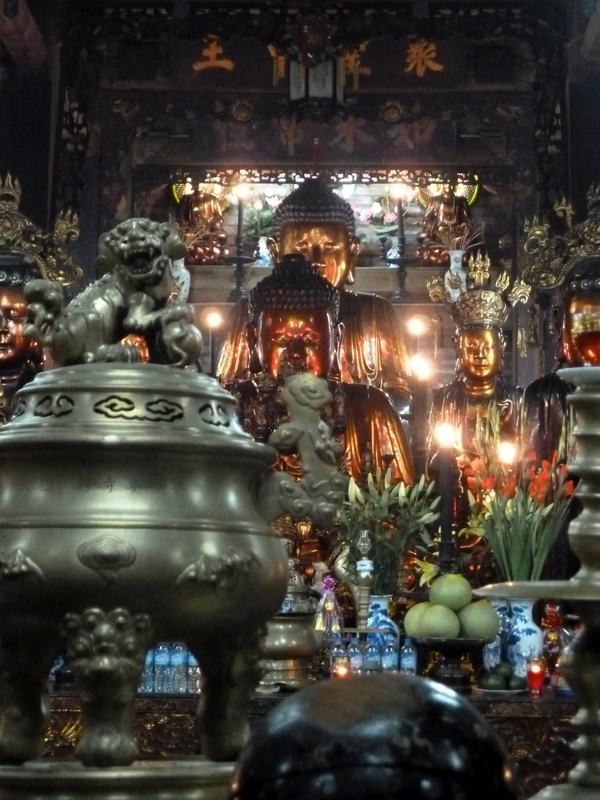 As always with pagodas, each animal and motif is symbolic, in this case often for good luck and prosperity. 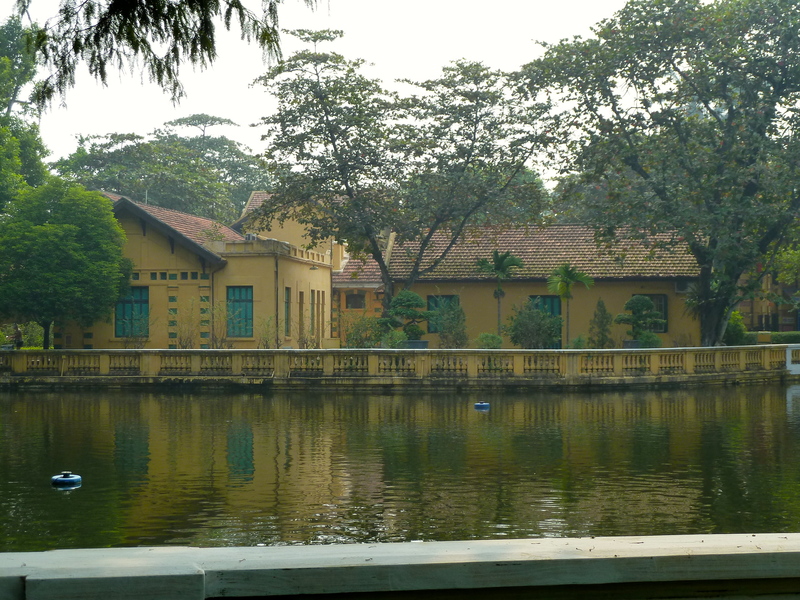 Our four days and three nights in Hanoi were wonderful. The food is spectacular, the sites are beautiful, and the city itself has so many nooks and crannies to explore. Now that I’ve been to the north and south of Vietnam, though not in a truly comprehensive way, I feel as if I have a real understanding of Vietnam’s diversity. As in many places, the north and south are hardly recognizable as part of the same country. The amount that I learn each time I travel is what keeps me coming back for more. Your photos are fabulous. So is the entire blog.